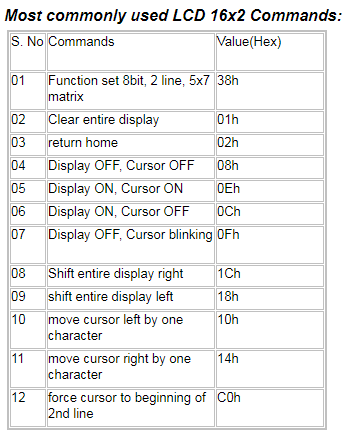 LCD display is one of the visual display used in microcontroller Projects, Various Flavors of LCDs are available but one of the most common LCD is 16 x2 (it means 16 columns and 02 rows). In this LCD each character is displayed in 5x7 pixel matrix. This LCD has two registers, Command Register and Data Register.Pin no 4 of LCD is labeled as Rs(Register select), if this become low then this LCD gets instructions or commands if Rs becomes High then same data pins of LCD gets data. if RW pin no 5 of LCD is LOW means LCD is configured as writing. 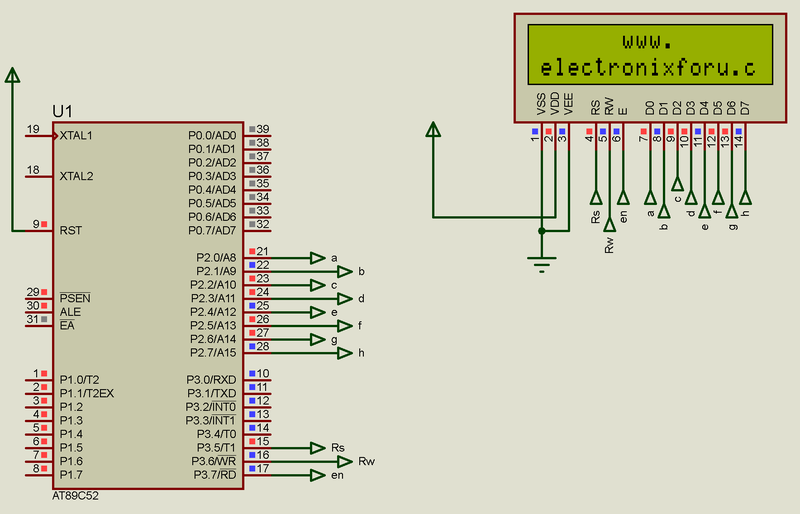 so RW pin of LCD can be controlled from microcontroller, or it can be directly connected with ground,Pin En(enable) of LCD should be high to low for short moment. Pins (D0 to D7) are Data pins, same pins are used for Commands. Complete circuit of LCD 16 x 2 interfaced with AT89C51\52 with 8 bit mode is shown in the circuit, which uses a crystal frequency of 12MHz, a power on reset circuitry with capacitor and Resistor Pair and "EA" pin of Microcontroller is also attached to VCC (means Internal memory is used).